Fill packet with desired product. Carefully heat seal open end of bag with a household iron (medium setting) for 1-2 seconds. Label sample as desired. COMMENTS: These are the perfect size for small samples without breaking the bank. Love these! Easy to use and seal. 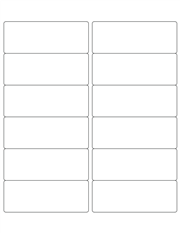 COMMENTS: These are a nice and affordable way to distribute a small sample of your product. "Perfect to sample skin care products"
COMMENTS: Great sample size for lotions, balms, salves and body butters. I use a baster type syringe to fill the packets which makes it easy and I have plenty of room for product name on one side and ingredients on the other. Great to pass out as samples or throw in with my mail orders for customers to try out. COMMENTS: Excellent product used for facial masks for samples. COMMENTS: Great little packets to provide some sampling of my body lotions. Work great in filling and sealing with a simple flat iron. No special equipment with using these!! "Great for sending lotion samples"
COMMENTS: Great for sending lotion samples. Easy to use. COMMENTS: I love these sample packs for handing out sample lotions to people. Easy to fill and seal and they make a great impression on customers. I label just as I would for full size products but obviously on a smaller scale. Please don’t stop carrying these! COMMENTS: I purchased these to use for single use face mask. They are easy to fill and easy to seal. Will be using them to lotion samples soon too! I love them! COMMENTS: I absolutely love these for lotion samples! They seal very well with a heat sealer without leaking. Great quality to boot! COMMENTS: Since starting to incorporate these handly little samples for my products it has really helped me boost sales. I can pass out these trial size samples and get feedback and it really stirs interest for a product. They are easy to fill with a pipette and seal quickly. I will buy more of these! COMMENTS: This is just the best way to allow customers an opportunity to try a product. I had been giving too large of a sample to prospective customers. This allows me to promote new products too. COMMENTS: I got these and was like hmmm i dont know. But wow how freaking cool. I made samples today. Its neat and easy. I do not have a iron. I used my hair straightener which i never use so why not?. I will buy these again. 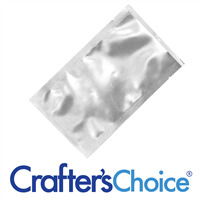 "Heat Seal Sample Packet - Silver, 2 x 4.75 inches"
COMMENTS: This Sample Packet is great for preparing Samples. I've used it for Balms, Salves, Hair Oils, etc. Because one side is clear my customers and I can see what is in the packet. It seals very well with a hot curling iron. COMMENTS: I love this product. They are the perfect size for samples,easy to fill with small amount of lotion. COMMENTS: I love these for giving out samples! I agree with other reviews that it is a bit hard getting product into them. I used a pastry bag but it was still a little messy. COMMENTS: If you get oils where you need to seal you will have issues sealing these. Use a syringe to fill. They work great to package samples. I am buying more!! COMMENTS: I love these so much. I use them for free samples to send with orders. Easy to fill and easy to seal. COMMENTS: I use for lotion samples. They are perfect and look very professional. Easy to seal and easy to tear open. COMMENTS: These worked great for my samples. They are easy to seal with a hair straightener. They have an indention on one end making it easy to tear open. COMMENTS: I had been looking for a safe way to share samples of my lotions at shows, in on line sales. These are PERFECT!!! So professional looking. I love them! I filled 50 for a grand opening in less than a half an hour and they are beautiful! COMMENTS: These heat and seal packets were the perfect solution to my sample issue! I wanted to give out free samples, but I also did not want to give away lots of product either. It is big enough to where my customers can get a nice amount to be able to test the product, and its small enough for me to include in a shipping package without having to worry about it being too bulky! So these are absolutely perfect for my hand cream samples! Highly recommend if you're thinking about giving away samples! COMMENTS: These are great for all of my samples of creams & lotions! COMMENTS: Just a little small for my taste. COMMENTS: Tattoo Artist are a big deal for my company! and THEY LOVE sample packs! these are prefect easy to handle easy to seal! great product, even better price! COMMENTS: These little guys are super easy to seal and they're sized for a generous portion of facial masks. They're easiest to use with an injector (I fill them with a large syringe, but a flavor injector or turkey baster should work well too, depending on your product). "Great Sample or Single Use Size"
COMMENTS: These are great for lotion samples. COMMENTS: Very easy to fill and seal up. Great for samples. "Great packaging for single use face masks"
COMMENTS: I was nervous at first to use this package. but once we tested it, it's a wonderful package for those single-use, try-it sized face masks. Thanks! COMMENTS: Once I figured out how to fill these little packets the more I grew to love them. Hold the packet open use a syringe or a small spoon to insert a small amount of your product towards the very bottom of the packet. Carefully, squeeze out any excess air and heat seal. Easy breezy! I made a complete mess the first dozen, especially with my lotions. But, now I'm very confident in using this. Customers love samples/trial size/travel sizes. I give a sample with every order and even attach them to my business cards. COMMENTS: I got these to be able to send out little samples of facial oils and such. This is a perfect small sample size. I use a pipette to fill them. An impulse sealer will not give you a good strong seal with these at all. But they seal very well with an iron. COMMENTS: Very easy to use, makes ultra professional looking sample packets! COMMENTS: I use these for liquid samples and I'm sure you could do small volume products also! It's perfect for a little sample of a liquid product or maybe even a full size of something concentrated. Handy little bags that don't leak! COMMENTS: These foil sample seals are the perfect fit for letting customers try out my lotions before the decide to buy a larger size from. Will definitely be buying more since I'm now all out. COMMENTS: great for samples. gave these out at craft shows. COMMENTS: These heat seal packets are great for packaging samples to mail out. "Economical, Variety of Uses, Perfect Size, Etc." COMMENTS: I love these foil sample packets. I use them for my creams, lotions and will be using them for bodywash and sugar scrub in the future. With the right labeling, they make great quick gift sets. I attach them to business cards for networking events. I could go on. It would be nice to have a smaller one or slits for opening on both ends for when I cut them in half when smaller samples are needed! COMMENTS: Perfect size for lotion, cream, butter cream and butter balm samples. "Love these little sample packets! " COMMENTS: I love how easy they are to fill and so quick to seal! They look great! I put a label on them and send them out with my mail orders or give them out at craft shows. The customers always appreciate being able to "try before they buy." • Ease of use. Promoting future sales. "Finally I can have samples!" COMMENTS: I love these little pouches. It took me a couple tries with the iron before I could seal the first one but I got it. When filling them, make sure you get the liquid down far enough so that the end is not moist. "perfect samples every time "
COMMENTS: I use this to make 1-Tb samples of powdered laundry detergent to give out. They are relatively easy to fill using a funnel, and seal nicely. We spent a long time using an iron and a hair straightener (flat iron) to seal these and recently changed to an impulse sealer. Do yourself a favor and get one of these right away, they make the seal look much more professional! COMMENTS: Quality product. Easy to use. COMMENTS: This product is fantastic. All that is required is the product you want to put inside and an iron. Labels are easy to add as well as just writing on the package with a permanent marker. Out of the 400 I bought, I only had one that did not close properly due to me over filling the package. I will be ordering this again. I would like to see this product offered in smaller packaging. COMMENTS: I used these for samples of sugar scrubs. Very easy to seal with a hot iron. Did 10 to test. No problems. Every single one sealed perfectly. Was able to get about an ounce of sugar scrub in each. Will buy again. COMMENTS: Customers always love FREE stuff, and these handy packets make it an affordable option! Easy to use! COMMENTS: This is a great way to include one-time use samples with your products. I love both size packets and they are a great way to use up extra product if you have left over from master-batching. I try to include a sample or two with every order and have generated sales from this technique. I also keep some sample packets in my purse so I can pass them out if the conversation comes up. COMMENTS: I love this concept. Now I'm able to give out samples of all my liquid products. Super easy to use and nicely priced! 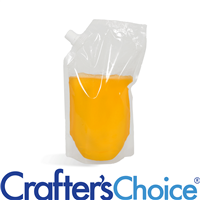 "Crafters choice heat seal sample packet"
COMMENTS: I have used these to give samples of my liquid soap to customers. It is so handy and the response has been very positive! • Make it easier to open. 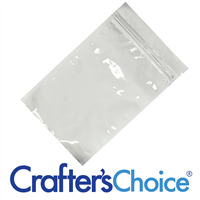 "Crafters Choice™ Heat Seal Sample Packet - Silver,"
COMMENTS: I use these to include sample size try me gifts when i ship products to my customers. Easy to use and economical. COMMENTS: I really like the product, but sometimes the end does not seal correctly and product does leak through. I would say out of the 50 about 3 would not seal. COMMENTS: These are great quality and professional looking! Great price too! COMMENTS: this is the perfect sample size. Easy to use as it seals using a warm iron. I love these! COMMENTS: These are the perfect size for lotion samples which is what I got them for. I will be getting more next month, easy to label and seal. COMMENTS: I love these little pouches for laundry liquid samples! The amount is perfect for a small load. My labels fit perfectly on them as well. And the price is excellent! I've had absolutely no problems using these. COMMENTS: These little bags are perfect the single use dry face masks I made. I used a small funnel to pour order in the bag without a mess. They sealed perfectly. I will likely use these for sample salts, creams, scrubs etc. I use Avey labels and they stick no problem to this packaging. COMMENTS: These make really nice samples to give out. I will buy more. They can be a challenge to put product into. I am still perfecting the process, but for now... I hold the packet open in my left hand while squeezing the product from a SMALL cut in the corner of a baggie. Bigger cuts cause blobbing and require alcohol clean up at the opening. I DO NOT fill the packet all the way up! I found that between 3 and 4 grams of product is AMPLE for people to try. Especially since when I applied 1 gram of lotion to my own hands, it was more than enough. These packets FEEL bigger when sealed. I put a small cup on my gram scale tared out with an empty packet in it. Then after I add product to the packet, I set it back into the cup to see how many grams I added. Pick it back up and seal it. I used a $10 Flat Hair Iron from Wal Mart to seal them as I held the packet upright in my hand. Worked perfectly on LOW setting. COMMENTS: I used these sample packets to mail samples of my homemade sugar body scrubs and it worked like a charm! I used my home flat iron to seal the packets and applied personal description labels to the front and instruction labels on the back. If you haven't noticed, Wholesale Supplies Plus also has a YouTube video with instructions on sealing the packets. It might take you a couple of tries but well worth the time. Good luck! "Easy way for customers to sample my products"
COMMENTS: I wanted a way for customers to "take home" a sample of my liquid products. The heat seal sample packets were perfect to fill that need. They were easy to seal and give out with a label. "Sealed 300 as free samples." COMMENTS: It makes a nice sample because it has a nice amount of area to post labels with all your information. A bit tricky to fill, I found it worked pretty well using a pastry bag with the small stainless leaf tip. Easily holds .5 oz and very easy to iron closed. • Ability to heat seal with a normal iron. • Tricky to hold pastry bag and fill. COMMENTS: I used my flat iron to press closed and it was simple to pipe in the product. Only a little bit fits these half ounce size, but still plenty for samples and one time use purposes. "The opening is way too small"
COMMENTS: I purchased this to make samples for my customers. Unfortunately, I was not successful in filling the packets. The opening is way too small. I think the best way is to use a syringe or cake decorating bag. A small spoon can be used as well or pourable funnel if product is liquid. However, if the product is liquid then heat sealing becomes a problem. I made a bit of a mess getting the products inside the packet. Some of the product leaked out from the bag after I ironed the bag. I was very disappointed with this item. COMMENTS: I use these for individual masks and samples of diaper rash cream. Both of these have worked great. Don't use with bath salts. The packets swell up and burst. COMMENTS: These are great for samples & much more cost effective than tiny bottles. Filling takes practice but they are easy to seal with an iron, just don't over fill. You can writ on with a marker or label. I love these! Try them out, you want be disappointed! COMMENTS: I've ordered these sample packets several times!! Each time wondering why I didn't order more because I go through them so frequently. Perfect size for samples. When I make a little too much of my product, I fill a few packets, slap on a label, and I have free samples ready to go. Easy to seal and looks professional. COMMENTS: I use the small heat sealed packages for my facemask...they are the perfect size for the honey and the mask. COMMENTS: These are perfect for my handmade laundry soap! COMMENTS: I have used these for my body butter samples and they have held up well with no leaks! COMMENTS: I USE THESE TO GIVE OUT LOTION AND MUD MASK SAMPLES TO MY CLIENTS. THEY ARE AFFORDABLE AND RELIABLE. 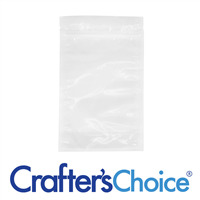 COMMENTS: These pouches are perfect for packaging my facial scrub samples. I shipped about 30 of them in my customers' orders and only had one explode. Sealed with impulse heat sealer. Will definitely purchase again. COMMENTS: I use this heat seal for my facial mask samples. Easy to use and it looks very professionally! COMMENTS: This is exactly what we were looking for to offer small (.5oz) samples to our customers. They look amazingly professional (tear tab and everything) and don't take up a lot of space. We seal the bottoms up with a hair flat iron on the lowest setting, that keeps the contents from dribbling out. COMMENTS: Good size for samples. "Works great but fill carefully"
COMMENTS: These work as stated, sealed easily, and easily tore open when used as well. The opening to fill is so tiny though. There wouldn't be a solution other then to use a bigger size, so this is not a complaint just a statement. I was filling with super fine powder that clogged my tiny funnel, and the next size was too big to work so I ended up having to pre-measure each packet then use a small spoon to fill, It took me forever. It would be a lot easier to fill with a liquid product or a coarser powder. Will use again just need to try a few other techniques first to try and speed up the process. COMMENTS: These are the perfect size for samples of oils, serums and things that you need more than a tiny bit to give someone and don't want it to leak! Just enough to see how the product works. COMMENTS: Very useful in packaging my dry fave masks and giving out samples to customers. COMMENTS: Had some difficulty filling packets with whipped products. I pounced on two by mistake and they didn't leak or break. Didn't realize the heat seal sample packets come in a variety of sizes. COMMENTS: I used to do 2 oz samples in jars and it was so expensive! This saved me a ton of money and it's truly a sample! I love this package! I only wish there was an option to have them printed on. But they are very easy to use! COMMENTS: Loved by me & customers! Great versatility for what products can be presented in this packet. COMMENTS: Heat Seal Sample Packet are great for samples. 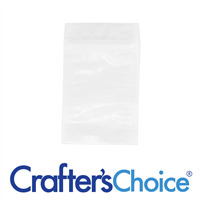 "Heat Seal Sample Packet - Silver, 2 x 4.75 inches "
COMMENTS: THESE ARE GREAT!! Just a word of advice - I had to bring my iron up closer to high than medium. It took me a few tries to figure out that a higher heat was needed - but they are easy to fill, don't leak and I used a Sharpie Pen to write on them before filling to say SAMPLE and what the sample was of. Everyone asked "how'd you do that?" LOL! COMMENTS: I adore these little packets!! Perfect for samples and one time use products!! I use for facial masks!! COMMENTS: Love these for sending samples of body butter, sugar scrubs, lotions. Easy to close with a (hair) flat iron. COMMENTS: Liked the video on how to use. 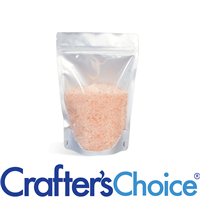 Good size for 1.5 oz of salts. COMMENTS: I use these for sample packets. They are a great way to get your products circulating. I've found that using a cheap hair straightener to seal the packet is much easier than using an iron, especially for liquid products such as body wash. COMMENTS: These packets are great to give out samples and they don't break the bank! COMMENTS: I like these for face masks. Very small, yet professional looking. I am considering the possibility of using these for samples as well. Thank you for having these in the product line up. "Great Sample and Mask Packets"
COMMENTS: This are great for holding samples and for grab bag exposure. COMMENTS: Okay. Like the poppy seeds I purchased from WSP, these can be cheeky little beggars with attitude issues as well, spitting stuff at you while you're both attempting to fill and seal. That being said, once you've done a few, you quickly realize how you need to fill / seal them so they DON'T get all sassy on you. They are actually great little containers and easy to use once you figure them out. They seal very well with a regular iron and stay that way - just make sure you check for bubbles or little gaps after you've sealed as it sometimes happens; but another quick pass of the iron and the problem was solved. They also look great, are very compact and portable and look very professional. So far, I've used them for both lotion and face mask samples and received nothing but positive responses. Apart from the "learning curve" (where you don't lose use of any of the products involved - just a tiny layer of enamel from gnashing your teeth a bit), they are great pouches and worthy of purchase. COMMENTS: I love these foil packets! They work perfectly as an inexpensive way to package samples and they look totally professional! My customers have been pleased with these sample packets. COMMENTS: These foil sample packets are excellent for handing out free samples without breaking the bank. I use a flat iron and voila! Samples! COMMENTS: These are so perfect for samples of face masks. They are so easy to use, and very easy to seal. I can send out a sampler pack of face masks for people to try before they buy! COMMENTS: I use these for sugar scrub, lotion, creams, facial toner and more. Thick or thin if closed properly will not leak. I have found using a flat hair iron with a piece of kleenex to protect the iron and bag works the best. In fact I bought a little cheap flat hair iron just to use for this purpose. I use this product to ship samples with every order!!! COMMENTS: I loved these packets until I had to fill them up. Once I finally got the product inside the sealing process was not the best and the packets burned very quickly with a heat sealer. I did not have any problems with the larger packets but I would think twice about buying these again. COMMENTS: We loved packaging this product for our chocolate facials. COMMENTS: Next time I will order the larger ones, but it's great for swag bags! COMMENTS: PROS: They're not super shiny silver, more of a semi-dull finish that looks just like aluminum, so they're the perfect complement for samples of products that I normally package full-size in aluminum bottles. They work well for almost any product. Excellent size, and very easy to fill. Not quite so easy to seal, a bit of a trick to it...when sealing liquids especially! If I made a lot of samples I might consider buying one of those small impulse heat sealers that seal pouches, and mount it on a wall and hold packets upright while I sealed them. Reasonable price. Never leaks. CONS: They don't always tear neatly because of the plastic inner coating, so I suggest customers cut them open, which is not ideal. And, apparently they're not recyclable, a shame for those of us marketing sustainable and eco-conscious products. COMMENTS: I have looked all over for a good heat n seal bag. When I ordered these I was SO happy for the search to end. This product is wonderful and my samples look very professional. They are so easy to fill and seal. I use my granddaughters unused medicine syringes to fill them and my old hair straightener seals them great with no leaking. I have ordered many and will continue to order them from here. Thank you WSP for all of your amazing products!!! COMMENTS: Love these ! I use them for soap, lotion and sugar scrub samples. Easy to fill and seal..I use a small hair straightener. COMMENTS: The only thing i would change about these perfect little sample is to make them easier to tear open. That was probably the only thing I didn't even consider being a problem, but it turned into the only issue i had with them. They label easily, are easy to fill and close, but even tearing with my teeth sometimes doesn't work. Using scizzors on them kind of takes away from the point. COMMENTS: I used these to have samples of my lotions , butters and serums for clients. They seal rather nicely, can't think of any issues, and they are easy to affix a label too! COMMENTS: I love this product! I have had no problems with any leakage. I use a flat iron on a high setting for a few seconds. When filled and labeled the package looks very professional. I label the front of the package and staple a mini moo business card on the back. COMMENTS: these heat seal easily. COMMENTS: I like that this product is well made and solved my problem also, it is very easy to use.I highly recommend this for anyone who wants to give away cost effective samples. I'm a customer for life! COMMENTS: These are the best foil packets out there right now! They are much higher quality than the ones from other sellers and at a great price. They seal easily, the foil doesn't come unsealed and pull away from the liner, and isn't so thin that they crumple up and look like a 2 year old has been playing with them (and I know what THAT looks like). "These are great for samples!" COMMENTS: I have used these for multiple products I carry; pet shampoo, lotion, and shower gels. I have had a few problems with sealing a few of them. They seemed sealed and later leaked. I actually use my flat iron on the highest heat to seal these as it makes it a lot easier to hold and seal. I would recommend these. "new way to seal these packets"
COMMENTS: If you have a Food Saver vacuum sealer-this appliance works great to heat seal these-I cut the 2X4.75 in half vertically making 2 small squares-this appliance also seals the ends of your shrink wrap bags & bands,too. Worked great! COMMENTS: These are great for packaging up samples of face creams and lotions. . . much better than having many people use product out of a single jar and possibly causing contamination. Since it holds quite a bit, the pouch can be cut down to half it's size for smaller quantities. Very cost effective. I've not tried it, but was thinking these would be great for packaging up medicines (pills) when going on canoe trips....just a thought. Slip the pills in the pouch and seal, making it water-proof. COMMENTS: These are great for giving out samples of my mask powder. Just seal it at the end and add my label - perfect! COMMENTS: Get a flat iron and a squeeze bottle with a long tip. Work up a nice label and you have N absolutely beautiful, professional-looking sample in no time! COMMENTS: These are so perfect! I was using small containers for samples which cost me a lot not only for the containers, but for the amount of product needed to fill them. I fill these babies with .25 oz of lotion, cream, or scrub and the packets themselves only cost .10 each, so I'm saving a bundle. PLUS, because of their smaller and lighter size, they are easier to store and cheaper to ship. They look so professional and customers love them. COMMENTS: I was very pleased and surprised with this product..up until now I have been giving away full sized product as samples and I no longer have to do that with these. COMMENTS: Wonderful product, great customer service, fast delivery! I love the convience of handing out the packets. They look very professional. COMMENTS: I have to give these a thumbs up. They are great sample packets and hold quite a lot of product. I use them for various things like lotion and massage oil samples and have had no problems when sealing with a flat iron. The only exception was when I tried to make samples of salt scrub. The majority of those eventually leaked and I believe the culprit was the salt getting in between the seal and probably breaking it down. I know next time not to use them for that but they give such a professional look to my handmade products and people are always impressed that I packaged them myself. "Just what we've been looking for." COMMENTS: These are perfect for our samples, they seem more professional than our other sample containers. COMMENTS: This is a good little sample packet. It looks professional once labeled. Very easy to use, but it is also very easy to overfill. I will continue to buy these for my sample packages. 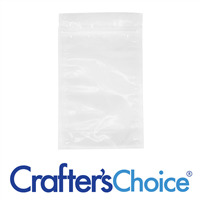 COMMENTS: I use these to put my samples in and absolutely love the professional look! Just the right size, easy to use! COMMENTS: These are great samples for my face masks for customers who may have never tried a clay facial and look to try it out first. These are the perfect size for one time use. COMMENTS: We use these for lotion and conditioner samples. Very easy to use. COMMENTS: I've tried other ways of sampling , even fancy little jars, but unless they are full,, the small amounts have dried up on me;(. These are so handy , pretty and very well priced! COMMENTS: These are the perfect size to hand out samples! The price is good as well. They are very easy to fill as long as you don't try to over fill them. I find I can fit about 1/2oz without having any issues with messes when filling, however you can fit a bit more than that if you wanted. COMMENTS: These are just perfect for when I have "leftovers" after filling my product bottles. COMMENTS: I love these packets! They are perfect size for mailing out of state to my family and friends. COMMENTS: These are the best things since pants with pockets! These have made my life SO much easier to get my liquid/soft products out & to my shoppers to sample without making a mess! I would have to say they have seriously improved my sales! Worth every penny! COMMENTS: I use these to give out samples of my lotion, cream soap and sugar cream soap. They are perfect and very professional looking. They seal effortlessly with my impulse sealer. Not one leak ever! COMMENTS: Great buy! I use these for samples of my hand and body creams! They are super professional and customers love getting them. They make giving out samples easy and inexpensive. I still find these a little large so I cut them in half and get even more bang for my buck! COMMENTS: These are absolutely perfect for sample sizes! Love them! Just what I needed for sampling my new products. "Love these - Great for sampling our healing balm"
COMMENTS: These sample packets are wonderful, and we've gotten great customer feedback on them. I cut them in half horizontally, heat seal one end, and cut my own tearing notches in the new packet to create two smaller sized packets. That makes them the perfect size for our healing herbal balm samples. Wonderful product! COMMENTS: These are just the right size for samples! And you can cut then in half for small samples like face cream or in thirds for scent samples. COMMENTS: I trim these to the size i want. very easy to use! COMMENTS: I use these for facial moisturizer, shampoo, and conditioner samples and they are perfect! When I first got them they were bigger than I expected but the size is great. They are easy to fill and easy to seal. If you use them for any kind of liquid I recommend using a clean towel over your ironing board while sealing because it can spill out very easily. "Using the label to upsale"
COMMENTS: I love this product because it saves on how much of a sample I give to a customer and that I can make one up for them right in front of them and let them take it to try. I label it with the type and my number and they have what they need to contact me. the scent, the name, and my number. • perhaps make one slightly smaller. COMMENTS: These are a must have for giving out samples! 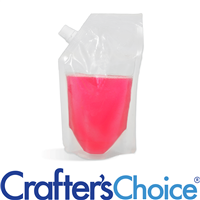 COMMENTS: These heat seal packets are perfect for samples of my products. I actually cut them in half. They seal really easy with my heat sealer! COMMENTS: SIMPLE AND SUPER EASY TO USE!! COMMENTS: I make Dead Sea Mud masks and these little packets are absolutely PERFECT. The description says that they hold 1/2 an ounce but I'm able to put up to a full ounce in them. To fill them I put my mud formula in a baggie with a piping tip on it. I place my opened packet in a container that holds it upright and set it on my scale. Super easy to get the exact amount I need in that little packet. I hope you never discontinue this product as I will definitely be reordering! 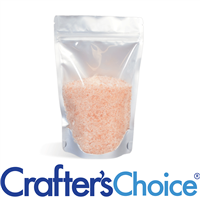 COMMENTS: More economical than the little jars and with the right label still looks high end, seals great and contains a decent amount of product. I will be buying more. COMMENTS: These little sample packets are wonderful! You can easily cut them in two for smaller samples such as lip balm. These look so professional with my label on them my husband asked me who I got them from! I said I made them! He was sooo impressed! Definetely a must have and very economical and extremely portable! One final thought and tip, if you have a hair straigtener, set it to low, it works like a charm to seal these little babies. COMMENTS: I use these for my whipped body butter samples and found a clever way to seal with an old flat iron which seals them right up. I label and off they go!